Verbs IM is a new universal instant messaging app for the iPhone, iPod touch and iPad. Verbs IM is fairly new and has been out for less than a year and is only $.99 to download. There are a lot of instant messaging applications available on the market, and it can be difficult to find the right one. Verbs IM is hoping to eliminate all of your instant messaging problems by combining Google Talk, Facebook chat and AOL instant messaging into one great iPhone app. Verbs IM is easily one of the best performing instant messaging apps available for the iPhone and iPad. All of your friends are displayed so that they are easy to see. A huge plus of Verbs IM is the overall design of the application. Verbs IM looks and feels like is was designed by Apple to work specifically on their products. Users also have the ability to send photos and documents through the application with no problem. The only problem with the performance of Verbs IM is that there are no push notifications included. You can purchase the ability to get push notifications, but that will cost you an additional $5. When it comes to stability, Verbs IM is at the top of for instant messaging apps. You can have Verbs IM run in the background while you surf the internet or play a game. This gives you the freedom of being able to use your device without having to sit and wait for another message. If you receive a message, then Verbs IM will notify you and give you the option of pulling up the message. Verbs IM runs in the background without slowing down your device or crashing, which is essential to most customers. There is not a instant messaging app available that is easier to use than Verbs IM. 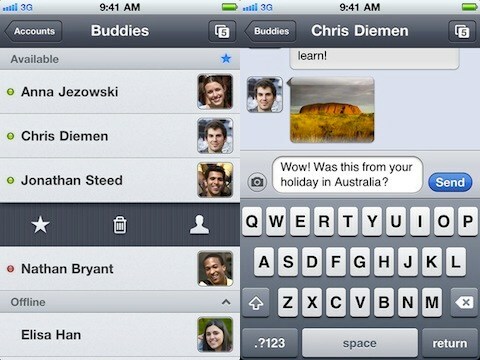 The layout of Verbs IM is very similar to the layout that you will find in the text messaging section of your iPhone. If you have the ability to text on the iPhone, then there should be no problem using Verbs IM. Since Verbs IM costs less than a dollar, there is extreme value if you are constantly instant messaging. The ability to combine Google Talk, Facebook chat and AOL instant messaging makes the process easier than ever, and is well worth the $.99. If you use any of these three messaging services with regularity, then you will be able to get a great value from this iPhone app. 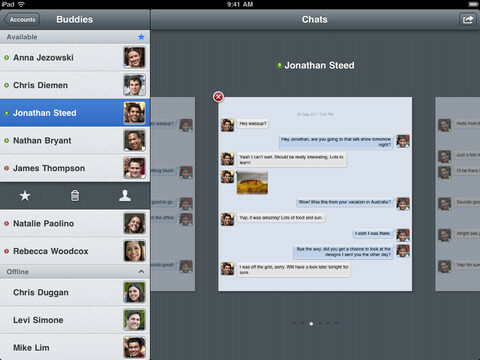 Instant messaging apps are some of the most reusable apps on the market. You will be using Verbs IM every time you want to talk to one of your friends. Verbs IM will easily be one of your most used apps on your device. The extra cost of push notifications will deter some people, but it will be hard to find anything better than Verbs IM. AppSafari review of Verbs IM was written by Joe Seifi on November 1st, 2011 and categorized under App Store, Chat. Page viewed 5065 times, 1 so far today. Need help on using these apps? Please read the Help Page.